Grand sporting tournaments can support a whole lot of industry around them – be it merchandise sales, infrastructure upgrade or ticketing revenue; and boost ancillary sectors such as tourism and hospitality. At first, it was the FIFA World Cup 2010 that saw manufacturers of vuvuzela making fortune from the sale of trumpets. The bonanza was followed by IPL Season-3 which saw maximum merchandise sold in Mumbai. And now, it’s turn of the organizers of Cricket World Cup to rake in money from sale of merchandise and stadium tickets. Yes, the countdown has already begun. The tenth Cricket World Cup tournament to be held in Indian sub-continent region will get underway on February 19. The grand tournament is expected to rake in over $1 million from the sale of merchandise. Further, at stake are sponsorship deals worth Rs.150 crore and ticketing revenues of Rs.125-150 crore, culminating from about 2 million tickets to be sold for the 43-day tournament. The World Cup Central Organizing Committee had already released over 1 lakh tickets as part of its first phase of online ticket sales in Mid-2010. 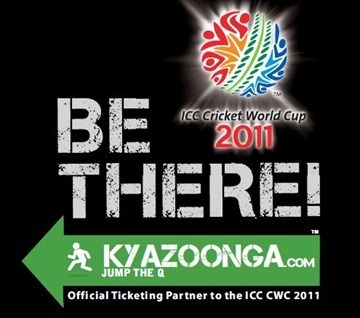 KyaZoonga.com, which had kicked-off the first phase of ticket booking through online platform, is the official ticketing partner for this mega cricketing event. The second phase of sale of tickets would be available through retail outlets, travel-operators and box-office sales. The overall prize money on offer is around Rs. 45 crore for the whole tournament. It is said that Cricket is a gentleman’s game. But, here is a reality check – the winning team in the World Cup takes home Rs.13.5 crore; is more or less equal to what individual players in recent IPL Player’s auction claimed to have settled for. That’s how far IPL seems to have got ahead in the race of making moolah. A report provides that the subcontinent’s aviation and hospitality industry may gain by Rs.100 crore from various avenues. And, guess what? India being a big favorite to win this tournament provides all the more reason for the spectators to be glued to every single match involving their local heroes. What’s more? Big Bazaar – India’s homely retail brand – is the official merchandise partner of the World Cup 2011. The retailer is all set to strike the hammer at the hot iron with its wide range of cricketing merchandises such as T-shirts, caps and headbands. So, are you ready for the grand sporting extravaganza? Want to know more updates on ICC World Cup? You are just one click away from that. Use this android/iphone/blackberry app for more information. These apps will save your precious time and give more information with very less money. As we get busier and technology gets better, we find that World Cup 2011 would be different than World Cup 2007 in many aspects primarily from the technological perspective. We get to share,review and analyze matches/players in the real time with tools such as Twitter,Facebook,Youtube and get reminders of our important business activities through our personalized resource planning system. All these certainly bring in more focus to the matches. What do the others say? For every economy there is a parellel economy. I think this parellel economy (betting industry and sale of tickets in black) will be several times greater than official economy (tickets, ads, merchandize sales, hotel occupancy and travel industry).